Becky Carroll, @bcarroll7, founder of Petra Consulting and author of, “The Hidden Power of Your Customer” hosts this session. This talk is about social media and employees [she says the name of the session is misleading]. What she is going to talk about applies to bigger companies but the small company should consider this. According to research, 87 percent of Americans online use social media. Customer loyalty is a social media sweet spot. That is what her book is about. There’s a lot you can do in social to help your customers feel good about your company. Eighty-one percent of Fortune 500 firms have a social media policy but only 31 percent have a formalized program for these policies. Training and policies together are important, not as a stand alone. Three good reasons for training: Understand expectations, ramifications and supports company if legal issues arise. Best practice sharing sessions with practitioners – everyone meets and learns from each other. Create certification. Intel has one. You can get a “black belt” in social from the company. They have about 60 classes. Update immediately after crisis and events. SocialMediaGovernance.com is a great resource for best practices. Some of the best social media policies are Coca-Cola, IBM, Kodak, to name a few. Watch and listen. There needs to be a monitoring program. What are people saying about you and your competitors? What are your employees saying? Lots of free tools such as Wildfire’s social media monitor, Google Alerts, etc. Best Buy staff = 180,000 of 24 years or younger. Ideal candidate for a policy. My pleasure, Becky. Great to meet you and I enjoyed the session. I know our readers will, too. Good stuff. Thanks, Becky! Great presentation – we’re thrilled to be able to share it on our blog. Hope you’re enjoying Hawaii in between all the conference action! 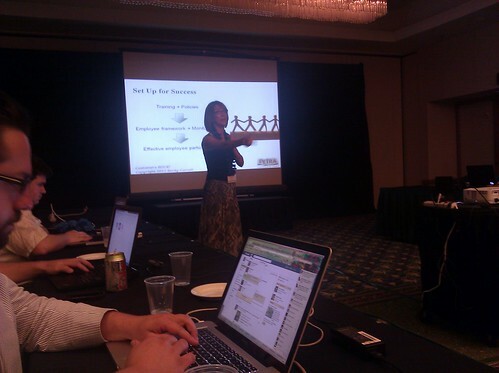 Thanks for sharing about my talk at Search and Social Hawaii, Jessica! I will post the slides to Slideshare later, and link to it from my blog.